Lebanon Police Department received a unique and appreciated donation. Gordon Plummer, the son of former Lebanon Police Officer Gordon “Bob” Plummer donated some of his father’s uniform items and equipment. Officer Gordon “Bob” Plummer served as an officer on the force from 1936 to 1939 and died in 1985. 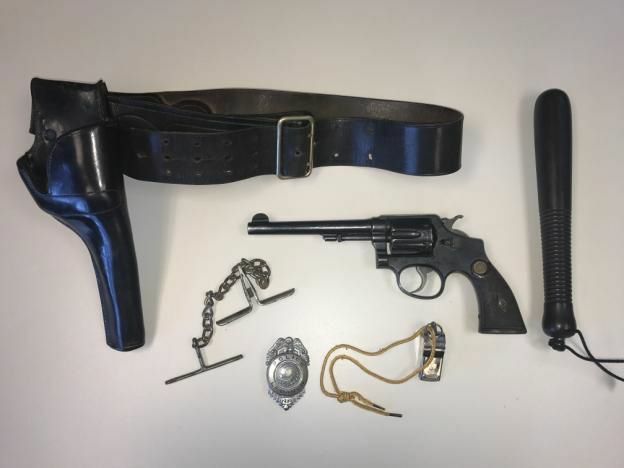 Mr. Plummer donated in his father’s .38 Caliber service revolver with the original leather holster and belt, a nightstick, whistle, wrist restraint and badge. Mr. Plummer also brought in several photographs and newspaper clippings from 1939. The clippings told of the murder of Ms. Freida Edson in 1939 at a beauty parlor most likely located on High St. The suspect was the owner of the beauty parlor, Henry Begin who lived on Fairview Avenue. The items were graciously accepted and put on display in the near future in the cabinet located in the lobby of the police station. Construction on Dulac Street in Lebanon has started. The street was closed Thursday and will be open for local traffic only Monday – Friday from 8 am to 5pm for the next several weeks. Dulac Street will be closed from Slayton Hill to Glenwood Cemetery. Please seek an alternate route. If you should have any questions please contact Christina Hall at the Department of Public Works at 603-448-3112. The Newport Farmers Market is accepting vendor applications for it 2017 season. The season will run every Friday from 3 to 6 pm, rain or shine from May 19 thru October 6. The Famers Market’s newsletter and accompanying application can be downloaded from their web site at newportfarmersmarketnh.com For more information email the at newportfarmersmarketnh@gmail.com, or call Richard Scheuer (603) 543-1488. The deadline for application is April 21.Full time vendor cost is $140 for the 21 week season, part-time vendors’ fees are $25 per week. Every week the Market offers concerts at the gazebo by local musicians, train rides for kids, and Story Time. Vendors may also be listed on their website with information about their offerings. An indoor gun range and retail store may be in Warner’s future. The Planning Board is holding a public hearing on the site plan this Monday, April 3 at 7:00 pm in the Lower Meeting Room of Warner’s Town Hall. Former N.H. Supreme Court Chief Justice John T. Broderick will join Dartmouth-Hitchcock. The former Chief Justice of the New Hampshire Supreme Court and Dean of the University Of New Hampshire School Of Law, will join Dartmouth-Hitchcock as Senior Director for Public Affairs. Broderick has been a prominent advocate on issues of vital importance to the people of the State of New Hampshire. He recently worked as a tireless advocate for the Campaign to Change Direction New Hampshire. It was the first statewide effort to advance a national initiative to change the culture of mental health.